Waffle House Inc. operates a chain of about 1,400 Waffle House Restaurants located in 25 states. The restaurants, which are either company-owned or franchised, pride themselves on serving good food fast, at a reasonable price, in a diner atmosphere 24 hours a day, 365 days a year. The menu includes everything from waffles and eggs to steaks and salads. Waffle House, according to information released in 1995 for the company's 40th anniversary, began as the dream of two neighbors, Joe Rogers, Sr., and Tom Forkner, who envisioned a company dedicated to both its customers and employees. The partners wanted to create a place where friends and neighbors could get together to enjoy good food served with a friendly smile. On Labor Day in 1955 they opened the first Waffle House restaurant in Avondale Estates, Georgia, a suburb of Atlanta. The first Waffle House restaurant was a smash, and the owners soon opened other Waffle House eateries throughout Georgia. Brown hamburger, sausage and onions together in 6-quart saucepan. Add pinto beans (not drained), add can of tomato sauce and add enough water to rinse can. Add beef bouillon granules. If using beef bouillon cubes, dissolve in 1/4 cup water then add to the pan. Add salt, black pepper, garlic powder, ground oregano, cumin, chili powder and sugar. Blend thoroughly. Bring to boil, reduce heat and simmer for 15 minutes. Serve. 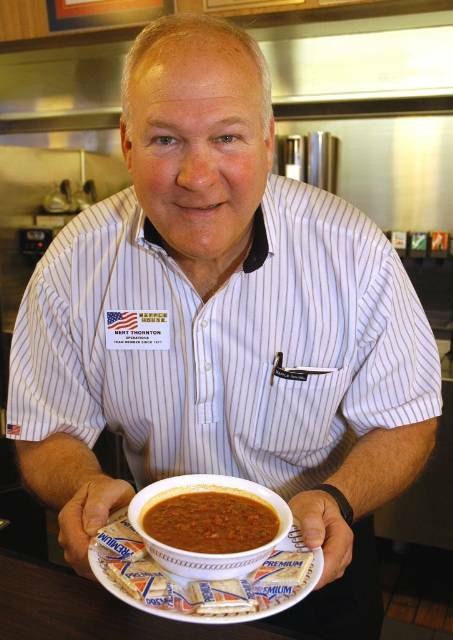 I've had this chili in the Cincinnati area.. and I found it horrible.. maybe it was a bad night. FYI, I live in S.Texas, and I go to the Houston Tx. area every year for about the last 25 years. I always passed a Waffle house, everytime. About 6 years ago, my wife talked me into stopping, we had some and I've been making some every time I get the urge for some great chili. No offense intended, maybe U, added or forgot something in the chili mix. OK, well hope you find you another recipe. take care. I made this yesterday and it is pretty close to the real thing if not better. Made hashbrowns to go with it. For someone who's closest Waffle House is over 400 miles away, this is a great substitute. Waffle houses in ohio stink. I love the ones in the south and this recipe is a great copycat. I use pinto and kidney beans. I just drain the kidney beans. The sausage is an interesting addition. Good, but not even close to being authentic. This is a guarded recipe just like Detroit Coney Island Sauce. 2013', had this chili, for the first time, on my way to La. from Texas, I stopped at a Waffle house, and had some chili, it was awesome. I asked the manager, he said go to the website and get the recipe, and I've been making this, since then. And my wife and I, love it. it's awesome. Thanks Waffle house. Copycat Recipes for items on the menu at Waffle House Restaurants.